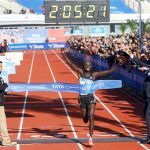 On Sunday, 18th October 2015, Bernard “Junior” Kipyego defended his title and won the 40th TCS Amsterdam marathon in a time of 2.06.19. In a race characterized by cold and humid conditions, the pacers started out on course record speed, but the group of elite runners were soon trailing about 10 meters behind them instead of drafting behind them. The low temperatures and drizzle made for a more conservative approach in the lead group with, among others, Kipyego, Wilson Chebet, Mike Kigen, Tsegaye Mekonnen and Chala Dechase. For a little while Tsegaye Mekonnen had a small lead over the rest of the group. But shorty after 30k, the last pacer Edwin Kiptoo stepped aside, the group came together. 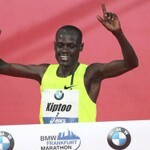 Kipyego delivered upon his promise to speed up earlier than last year and the group of leaders decreased to “Junior”, Chale Dechase (ETH), Mike Kigen en Ezekiel Chebii. 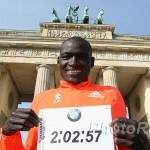 Kipyego finished solo gaining a minute on number two, Chebii who improved his PR with 2 minutes. Mike Kigen took 3rd place in 2:07.45. In the womens race, favorite Tiki Gelana did not feel fit and stepped out early in the race. With Gelana out of the race, Flomena Cheyech battled Joyce Chepkirui. 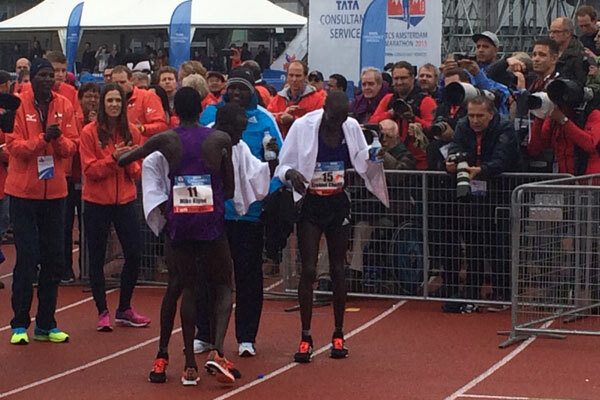 Chepkirui proved she’s not only fast on the 10k and ½ marathon, winning Amsterdam in 2.24.10. With this time, she improved her PR set in Boston earlier this year with an impressive 5 minutes. Cheyech followed in 2nd position after 25 seconds, Australia’s Milly Clark took 3rd in 2:29:07 in her debut marathon, also qualifying for the 2016 Olympics. Both joy and drama ensued for the Dutch elites, in their quest to qualify for the Olympics in Rio de Janeiro. 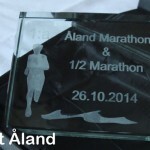 Dutch National Olympic Committee demands that athletes run faster than 2:11:00 to secure a place in the next Olympic marathon, while the IAAF Qualifying Standard is only 2:17:00. Abdi Nageeye managed, running 2.10.24. Michel Butter gave everything, but finished in 2:11.08. Mere seconds away from qualifying, Butter was inconsolable. Khalid Choukoud finished in 2:11:34, also just missing his target.